Margin = Leverage. Leverage = win more, also lose more. No need argue which is best. Margin is a financial tool, risky but if you are skilled, go ahead. I must declare I am not a user of margin financing. KC should chill out when trolled. Perhaps you may not understand what is a troll. "In Internet slang, a troll (/ˈtroʊl/, /ˈtrɒl/) is a person who sows discord on the Internet by starting arguments or upsetting people, by posting inflammatory, extraneous, or off-topic messages in an online community (such as a newsgroup, forum, chat room, or blog) with the deliberate intent of provoking readers into an emotional response or of otherwise disrupting normal on-topic discussion, often for their own amusement." Keep up the good posts, kcchongz. No...raider only agree that, those incompetent & lose monies....should not involve at stockmarket mah....!! Thus only Leaving the competent....that should be involve in stockmarket....loh...!! he was sitting listlessly at the corridor of a temple with a big milo tin in front. goreng....not everyone is satisfied with mediocre performance. A GOOD STOCK MAY SUBJECT TO FORCE SELL....AND AGAIN TAKE SOME TIME FOR IT TO RECOVER MAH...!! JUST LIKE CIMB....IT USE TO BE AROUND RM 8.00....BUT IT WAS SELLDOWN TO RM 4.00....AND NOW HAD RECOVERED SLIGHTLY LOH....!! SOME IMAGINE U R A CASH HOLDER OF CIMB....HOLDING COST OF RM 8.00..NOW AT RM 4.70....U WILL MAKE A SUBSTANTIAL LOSS OF MORE THAN 50% LOH..!! BUT MARGIN HOLDERS....THE SELL TRIGGER WILL ALERT THEM TO SELL WHEN IT IS RM 7.00 TO RM 6.00 MAH....!! For simplicity sake, let us look at a simple case. IN ANYCASE THE MARGIN HOLDER WILL BE LONG GONE AT 7.00 TO 6.00....B4 IT REACH RM 4.00 MAH.....!! THIS INDICATE MARGIN HOLDER WILL LIKELY TO LOSE LESS LOH...!! You advised a newbie to invest in CIMB shares “using margin to the limit”. You asked him to invest RM200000, RM100000 is his own money and the other RM100000 from margin finance, because the interest rate was so cheap, and it is stupid not to use margin finance to make more money to buy a good share like CIMB, plenty of margin of safety mah! AGAIN RAIDER WILL LIKE TO EMPHASIS IF A CASH HOLDER PUT RM 1OOK CASH ON CIMB.....AND HOLD UNTIL SAY RM 4.70....HE LOSSES AT RM 41K WILL NOT BE NOT LESS THAN THE MARGIN HOLDER WHO PUT RM 200K AT RM 8.00 AND LARI KUAT KUAT AT RM 6.50....A LOSS OF RM 37.5K LOH...!! BUT UNLIKE THE CASH PURCHASER....THE MARGIN HOLDERS NOW IS IN A SIGNIFICANT CASH & FUNDING POSITION TO MAKE PURCHASES IF HE CHOSE TO MAH....!! THIS SIGNFICANT MARGIN LINE.....ALLOW HIM TO TURNAROUND WHEN THE SHARE UPTURN. THE CASH PURCHASER WILL HAVE LESS FLEXIBILITY LOH..!! 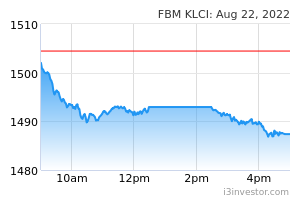 Then the poor fellow encountered force selling at RM6.00, or 25% drop of the share price. (FORCE SALE WILL BE DONE NORMALLY AT RM 7.00 TO 6.00 THUS RAIDER TAKE RM 6,50). He has now incurred a total loss of RM500000 because of the margins, THE LOSSES FROM THE FORCE SALE IS RM 37.5K LOH...!! ABOUT 19% LOSSES MAH..!!. Nevertheless, the margin user seems to be happier, according to you, because his shares have been forced sold at RM6.00(RAIDER SAY RM 6.50), and now he has “build up his capital” of RM50000, although he has made an exaggerated loss of RM50000(RAIDER SAY RM 37.5K) already. Now you advise him to buy CIMB at RM4.80, a much lower price than his forced sold price, and that CIMB is such a good company. HE HAS THE OPTION NOW TO BUY LOH....!! JUST LIKE MAYBANK...IN 1998-1999...IS FORCE SALEDOWN TO ABOUT RM 2.50 MAH....!! 1) Are you advising him to buy using his own money of RM50000(37.5K), or “use margin to the limit” again by using another margin finance of RM50000 (RM 37.5K)? YES...HIS GIVEN AN OPTION OF 2ND CHANCE TO RECOVER....VERY FEW PEOPLE GOT THIS TYPE OF OPPORTUNITY LOH..!! 2) If the earlier option, he has lost RM50000 (RM 37,5K), or 50% of his own capital, he needs to make 100% to recover. How long do you think he has to wait, just to recover his loss? RAIDER SAYS ASSUME THE CASH HOLDER WITH RM 100K CASH AND MARGIN HOLDER CAPITAL CASH RM 100K...BOTH LOSS SAY RM 40K...WOULD IT NOT BOTH HARD PRESS TO RECOVER ITS CAPITAL LEH ?? LOSING MONIES IS NOT DUE TO MARGIN OR CASH INVESTMENT....BOTH RUN INTO UNFORTUNATE BAD LUCK MAH....!! 3) If the option is the later, what would happen if CIMB drops another 30%? AGAIN RAIDER SAYS THE MARGIN HOLDERS HAS THE OPTION TO USE...HIS BUYING POWER LOH...!! TO BUY AND NOT TO BUY IS AT HIS OPTION LOH....!! IF CHOSE TO BUY THE SAME LEVEL OF CIMB SHARE AS THE CASH HOLDER....HIS LOSSES WILL NOT BE MORE THAN THE CASH HOLDER....SHOULD THEY HAVE THE UNFORTUNATE CONDITION OF LOSING ANOTHER 30% LOH...!! 4) Or you think the scenario is (3) above won’t happen? Why are you so sure? OF COURSE THE ABOVE SCENARIO...DO HAPPEN....BUT THIS LOSSES IS APPLICABLE TO BOTH THE CASH HOLDER AND MARGIN HOLDER MAH...!! YOUR ARGUEMENT & SCENARIO...IS LIKE PUTTING UP A CASE OF NOT INVESTING INTO EQUITY LOH....!! IT IS NOT...LIKE SHOULD INVEST IN EQUITY....BUT USE CASH BUT DON USE MARGIN MAH....!! BCOS THE CASH HOLDERS SUFFER ALMOST THE SAME LOSSES OF MARGIN HOLDERS LOH...!! Have you seen a couple of stocks in the portfolio posted here, a genuine portfolio, and not randomly selected stocks to fail margin finance, have lost more than 50% in just three months, even when the overall market went up? RAIDER ALSO SEE CASH HOLDERS LOSING 100% OF THEIR EQUITY TOO LOH...!! IT HAS NOTHING TO DO WITH MARGIN HOLDERS ONLY....IT IS THIS PEOPLE ARE NOT CUT OUT TO INVEST IN THE 1ST PLACE LOH...!! 5) If (3) above happen, what would be your advice again? And why? when we say gambling is bad, he will rebut that gambling is not that simple or evil as you viewed it. it is neutral, It can be viewed with a positive expected return or negative expected return. RAIDER ALREADY POINTED OUT USING MARGIN IS NOT GAMBLING LOH...!! MARGIN IS JUST A MORE EFFICIENT WAY TO MAGNIFY YOUR SUCCESS LOH...!! OF COURSE IF U R NOT SUCCESSFUL YOUR LOSSES WILL MAGNIFY TOO LOH..!! he is really my hero loh..... RAIDER ANSWER IS VERY SIMPLE ...IT IS FORMULATE WITH WHAT KC CHONG TALKING ALL ABOUT...HE CLAIM THAT HIS LEARNED INVESTMENT METHOD CAN MAKE SOMETHING LIKE 15% PA AVERAGE...THEN IF IT CAN BE DONE SUCCESSFULLY...THEN IT DOES NOT MATTER, WHETHER IT IS CASH HOLDER OR MARGIN HOLDER....THEY BOTH WILL BE SUCCESSFUL LOH...!! JUST THAT THE MARGIN HOLDER WHEN SUCCESSFUL WILL BE MORE SUCCESSFUL MAH...!! murmuring non stop, loh,loh...leh,leh, mah, mah......THATS WHY RAIDER SAYS ALL THE WHILE...IF U R NOT CUT OUT TO BE GOOD IN INVESTMENT...U SHOULD NOT INVEST AT ALL MAH...! IF U DO NOT INVEST AT ALL BCOS U R LOUSY IN THE 1ST PLACE...THEY WILL BE NO ARGUEMENT WHETHER TO USE MARGIN OR NOT MAH ?? I took our 2 ringgits from my pocket and put into his milo tin. YES PITIFUL BCOS THIS ARE LOUSY INVESTORS...NOT CUT OUT TO MAKE IT...IN THIS INVESTMENT WORLD LOH..!! Moral of the story: RAIDER AGREE..BUT USING MARGIN IS NOT GAMBLING LOH! Its obvious that leverage magnifies the losses. I dont know how people can argue that margin call is a good thing. Simple terms, if you leverage up to 2x, it takes a loss of 10% on the actual share price to make you lose 20%. If you use cash, you only lose 20% when the share price drops 20%. Also what makes you think cutting loss is a good strategy ? It is only a good strategy if share price continues to drop after your margin call triggered. What if after margin call triggered, the share price goes up instead of down, you would have lost the opportunity to enjoy the gains vs a cash investor who had the holding power. THIS IS PRECISELY WHAT RAIDER HAD BEING SAYING ALL THE WHILE. BUT ONE POINT...I WANT TO CORRECT KPFAM...IF U R NOT COMPETENT U SHOULD NOT INVEST AT ALL LOH....!! IF U DO NOT INVEST...THERE IS NO ISSUE OF USING MARGIN AT ALL LOH..!! IF U R COMPETENT...THEN U SHOULD INVEST LOH...!! THEN THE QUESTION ARISE...WHETHER U SHOULD USE MARGIN OR NOT TO MAGNIFY YOUR SUCCESS SINCE U R COMPETENT ? I gone through you comments with patience, then ,I realized why you like to paste other people comment. 1. "IF U R NOT COMPETENT U SHOULD NOT INVEST AT ALL LOH....!! so what about your new born baby who is not competent to eat, can he not eat?? your wisdom is not less wiser than my friend ah kau. ah kau will never miss any chance to preach his theory to his friends including me. do you know how I view you? moreover you are a good man , sharing with us how to get rich fast, God can not be that cruel, there is never a day I need not to put 2 pieces of RM1.00 into your milo tin. so what about your new born baby who is not competent to eat, can he not eat?? I am saying if u r not competent...acquire the competent 1st b4 use margin loh....!! Just like a newborn baby cannot run...then don run loh...crawl 1st mah...!! your wisdom is not less wiser than my friend ah kau.AS RAIDER SAY U FRIEND AH KAU...A LOUSY INVESTOR...CANNOT EVEN MAKE MONIES...USING CASH..HOW TO USE MARGIN LEH ? IN ORDER TO USE MARGIN U MUST BE GOOD INVESTMENT 1ST B4 YOUR RETURN MAGNIFY LOH...!! IF U LOSE MONIES...UR LOSSES WILL BE MAGNIFY LOH...!! ah kau will never miss any chance to preach his theory to his friends including me. YES THIS PRECISELY LOH...IN THE 1ST PLACE...AH KAU SHOULD NOT INVEST AT ALL LOH...!! IT IS PEOPLE LIKE U AND KC...LUMP FAILURE LIKE AH KAU, MISLEADINGLY...DUE TO MARGIN..BUT IT IS NOT DUE TO MARGIN...IT IS AHKAU...INCOMPETENT THAT LEAD TO HIS HARDSHIP LOH...!! he said :if you think you can win big you must hit hard, no bullet? dare dare borrow from ah long ,no risk no gain. that is how people get rich never let your chicken heart to have defeated your ambition to be super rich. BUT AHKAU IS SUPPOSE...TO BE A SMALL BABY...HE MUST LEARN TO CRAWL 1ST...HOW COULD HE WIN A 100 METRE SPRINTING RACE ?? AS HIM TO SIGN UP WITH KC INVESTMENT COURSE 1ST LOH...!! of course in real life there are some lucky ah kau,super rich ah kau, KYY is one of them, you are the next to be. U THINK PEOPLE LIKE MR KYY SUCCESS DUE TO LUCK MEH ? IT IS ALL SKILL MAH...!! MAKING MONIES FROM STOCK MARKET NOT EASY LOH...FURTHERMORE U NEED TO MAKE MONIES CONSISTENTLY...IN ORDER BE SUCCESSFUL LOH..!! BUT, in reality , there are far more unlucky ah kau. holding milo tin.AH KAU IS JUST A TYPICAL GAMBLERS...NOT ONLY HE GAMBLE...BUT HE MAKE USE OF MARGIN TOO LOH...!! U MUST DUE WITH POSITIVE EXPECTED VALUE PROBABILIY AND NOT NEGATIVE EXPECTED VALUE PROBABILITY MAH..!! WHAT MORE U BORROW TO GAMBLE, SURE U LOSE HELL MAH...!! with you super wisdom and competency and years of fortune telling expertise, you can never be the unlucky one. AS RAIDER SAY..THE SECRET OF INVESTMENT SUCCESS..IS DEALING WITH POSITIVE EXPECTED VALUE...THRU MARGIN OF SAFETY LOH...!! RAIDER SHARE WITH U THE WONDERFUL WORLD OF MARGIN...BCOS IF U USE IT PROPERLY...U WILL BE VERY SUCCESSFUL MAH...!! THIS TOOL U MUST USE IT PROPERLY WITH COMPETENCE LOH...!! finally you have made it clear that not every man can use margin finaning to invest. One must learns how to crawl first before run, be bottle fed first before eating with spoon . so , now I see , you are actually sharing something good. but I still like to remind you that the good value of your sharing is overshadowed by all the cut and paste that i suggest you should try your best to do away. What's a waste if your heavenly wisdom is not allowed to exhibit but hidden in the shade. try it out,without cut and paste, there is nothing to lose, I am sure you will find thereafter your wisdom will shine brighter and you will come back telling me in reality it is true, MAN PLANS but GOD DECIDES. When Raider say crawl....raider is not saying u go to learn margin financing straightaway....!! U start with what is a prudent way of investing....Go and learn from Good guys like Kcchong....!! After u learn....try investing...using cash 1st....!! Then check & monitor how successful loh.....!! Then u can be more confident.....!! Maybe if u want ....U may try out margin loh....!! Again start with a small amount & slowly build up...!! U increase your margin....only when your equity increase due to increase retained profit loh....!! I think most important...is to avoid being killed due to volatility. (1) That has to be done via significant diversification...and perhaps stocks which are really close to negative EV and high MOS. (2) Never use the Margin to the limit (have MOS here also)...so that you can dampen the damaging effects of volatility - avoiding losing your Capital significantly. I contributed greatly to the "agree amongst the disagree" here . You know although I don't know you in person at all, but you are the few who always give me moral support. So it is understood that i always appreciate your kind words, just like a few others. May be I have taken your kindness for granted. I am just joking with you. do not take it seriously, I take you as my sifu and a long acquaintance in i3.